Joint Pain- Can Herbs Help My Joint Pain? How Can Chinese Medicine Help My Joint Pain? Whether you are recovering from a torn rotator cuff injury, have joint pain from arthritis, or your back is aching from that long, glorious hike you took last weekend, acupuncture can be very effecting for the relief of joint pain in the body. Joint pain is one of the most common complaints we see in the clinic, and most of us have suffered from it at some point in our lives. Acupuncture is a great way to reduce pain naturally without having to resort to strong medications that often also have a host of unwanted side effects. It can also help to reduce the amount of pain medication required to keep the patient comfortable while also helping the body to heal. The insertion of acupuncture needles helps to reduce inflammation in the body and increases blood flow locally around the affected joints. Acupuncture helps to regulate the nervous system, which can boost the amount of natural painkillers your body makes, called endorphins. It also helps to release tight, spasmed, and shortened muscles back to their relaxed state. Seeing an acupuncturist for a series of treatments can greatly reduce inflammation in the body, reduce pain and swelling, increase mobility of the joints and reduce recovery time from surgeries. But what if you can’t get to your acupuncturist, or you would like to be able to add to your natural pain relief arsenal. Liniments have been used for pain relief for thousands of years. They are usually an alcohol-based formula containing a blend of herbs that have been soaked for an extended time to extract all the beneficial properties of the herbs. The advantage of using liniments is that they are very quickly absorbed into the skin, and often penetrate more deeply that an oil-based product. This is a topical liniment that I keep on hand at all times in my own medicine cabinet, and one that we prescribe most frequently in our clinic. Zheng Gu Shui or, “Rectify Bone Water”, is based on an age-old folk formula from the Guangxi Province of China. This particular formula is water-alcohol based with Menthol and Camphor being two of the prominent oils in the formula, making it feel cool/hot at the same time. The rest of the formula consists of a blend of Chinese herbs that are known to penetrate deep “to the bone”, and invigorate Blood and Qi in the channels. This makes it especially good for any type of arthritis pain or joint/tendon sprains, muscle strains, and bruises. You can apply the liniment directly to the area of pain 2-3 times a day or as needed. This is a dark colored liniment and may stain clothing, so you can wrap it with gauze if you’d like or just let it dry a bit before putting on clothes. Be sure to wash your hands thoroughly after applying this, and be careful not to get it in your eyes. 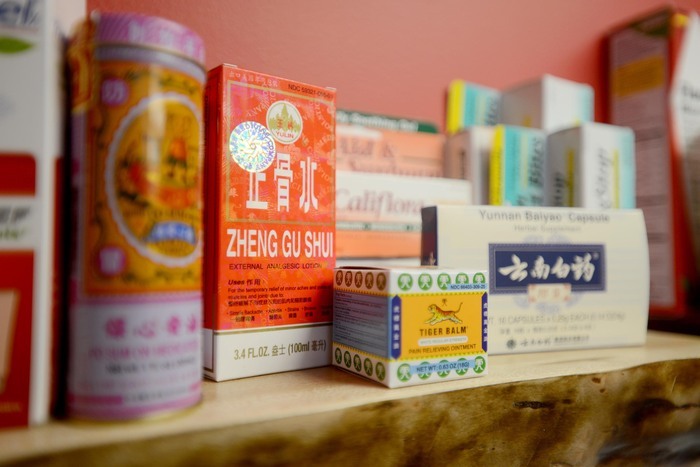 Zheng Gu Shui is for topical and external use only and should not be used on open wounds. Do not use Zheng Gu Shui near an open flame as it is flammable. It can be applied 3-4 times daily. This is a wonderful liniment to keep on hand throughout these activity-filled summer days!